Following on from the less-than-successful-but-very-nice-to-have-a-laugh-with-my-mates weekened of SITS, it seems that the mediocre showings at races have continued. In the last week, I’ve rolled up to the start of another two races, the first of which was a local cross country MTB race. The ‘Midweek Madness’ series is six races-long and takes place in various locations within a 10 mile radius of my house. Despite the location, I made my series debut on Thursday in race 6 (of 6, remember). Dave drove to mine and we rode the 4 miles or so via some urban singletrack parallel with the M60 to the start. I snapped my chain on lap 1. I had to wait until most of the pack had ridden past before I could retrieve my chain to repair it, as everyone was riding over it. Mended the chain. Consoled myself with the fact that I could probably catch quite a lot of people up and it was a lovely summer’s evening. Rode another lap. Overtook loads of people. Starting to find my rhythm again. 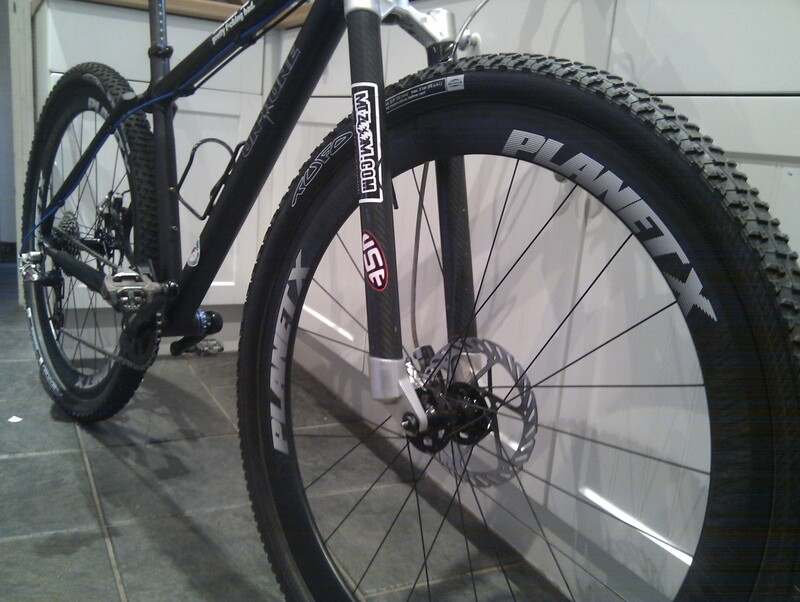 I’ve been experimenting with some tubular MTB tyres after PlanetX sent me some gorgeous Clydesdale carbon wheels with my new cross bike. The wheels had been fine for a couple of weeks prior to this race – they’re really stiff and light, a noticeable difference over my usual (and already silly-light) tubeless clinchers – but on lap 3, I pushed the front wheel hard into a bend and WHUMP the tyre came flying off the rim. Completely off. I’d attached them with ‘tub tape’ instead of glue and it’s safe to say I won’t be recommending the sticky tape method to anyone in the future…always use glue kids. In contrast, Dave did really well. Once I’d finished my short flight and then picked myself up off the ground I started the walk back to the start/finish area. That in itself was an adventure when a local kid rolled up on his scooter to ask me how much my bike was, how many gears it’s got and even offered to carry my front wheel back for me. Naturally I didn’t take him up on his kind offer. I was then followed by a surprisingly fast-walking drunk, recounting his tall tales of derring-do on his bike around Cheetham Hill. In spite of chains, drunks, thieving little gits and rolling tubs, the most exciting part of the evening was riding home on the road with a front tyre held on the rim with nothing more than some spit and a load of air pressure. So that was my XC race. 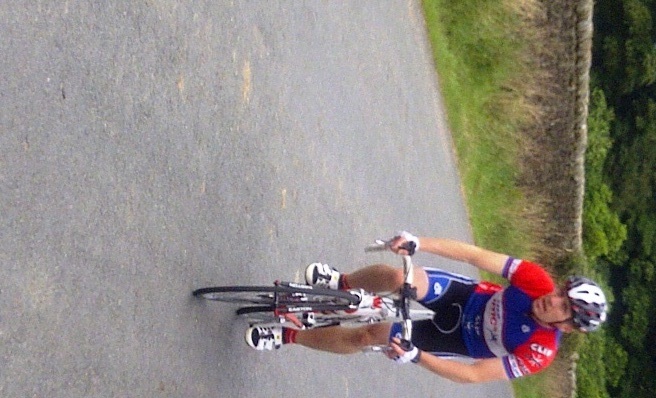 So I went to a road race a few days after that, a 60K race on the Dolphinholme road circuit near Lancaster. For whatever reason, I was regularly finding myself at the back of the pack, the changes in pace catching me out and forcing me to bury myself repeatedly to stay in touch. Then I got a puncture and put a hole in my rear road tubular (there’s a theme here) that was too large for the sealant inside. So I rode 6 miles on a flat and recorded yet another DNF. Erm…onwards and upwards then. Putting the last couple of weeks behind me, I’ll be concentrating on the ‘big stuff’ starting to appear on my horizon – the 3 Peaks Cyclocross at the end of September and Relentless 24 the week after that. There are a few epic rides and all sorts of races before then (both on wheels and on foot) and once again it’ll be a lot of fun trying to train specifically for a mountainous cyclocross race and a 24 hour solo mountain bike race at the same time.